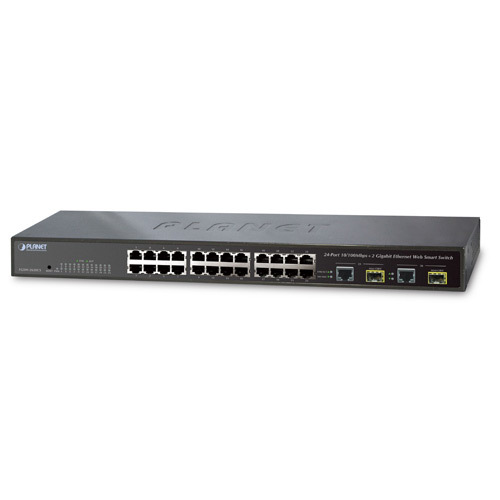 The FGSW-2620CS provides 24 Fast Ethernet ports and 2 Gigabit Ethernet ports and offers wire-speed packet transfer performance without risks of packet loss. It is equipped with non-blocking 8.8Gbps backplane; greatly simplifies the tasks of upgrading your LAN for catering to increasing bandwidth demands. The high data throughput makes the FGSW-2620CS ideal for most Gigabit environments, especially upgrading network to a Gigabit environment. For efficient management, the FGSW-2620CS is equipped with remote Web interface. It can be programmed for advanced switch management functions such as port configuration, port-based / IEEE 802.1Q / MTU VLAN, port mirroring, port trunk, QoS, bandwidth control, broadcast storm control, STP, RSTP, configuration backup/recovery, MAC address / TCP & UDP filter and IGMP Snooping v1/v2. The FGSW-2620CS provides Port-based / IEEE 802.1Q / MTU VLAN (port based / IEEE 802.1Q VLAN including overlapping). The VLAN groups allowed on the FGSW-2620CS will be maximally up to 26 for port based or up to 32 for IEEE 802.1Q VLAN groups. On the other hand, the MTU VLAN divides port 1 to port 24 as separate LAN group and only can access the public port 25 / 26 or port 26. Via supporting port trunking, the FGSW-2620CS allows the operation of a high-speed trunk to combine with multiple ports. The FGSW-2620CS also provides two groups of up to 4-Port 10/ 100Base-TX trunk support with up to 800Mbps bandwidth per trunk and 1 group of 2-Port 10/100/1000Mbps trunk support with up to 2000Mbps bandwidth per trunk, and supports fail-over as well. The FGSW-2620CS is equipped with the MDI/MDI-X auto detection for easy plug and play connection, regardless of cabling types in straight through or crossover. In addition, with its auto-negotiation capability, all the RJ-45/UTP ports of the FGSW-2620CS can be configured to speeds of 10/20Mbps / 100/200Mbps (Fast Ethernet) and 1000/2000Mbps (Gigabit Ethernet) automatically. The two Gigabit combo ports of the FGSW-2620CS can be either 1000Base-T for 10/100/1000Mbps or 1000Base-SX/LX through SFP (Small Form Factor Pluggable) interfaces. The distance can be extended from 100 meters (TP), 550 meters (Multi-mode fiber), up to above 10/20/30/40/50/70/120 kilometers (Single-mode fiber). With 24 10/100Mbps ports and up to 2 copper or Gigabit Ethernet fiber ports, the FGSW-2620CS provides a cost-effective, high-performance solution for power users. The FGSW-2620CS can easily build a local, high bandwidth Fast Ethernet network for backbone of your department by performing 8.8 Gigabits per second, non-blocking switch fabric. With the two built-in SFP ports, the FGSW-2620CS provides the uplink to the backbone network through Gigabit Ethernet LX/SX SFP modules. 2014-02-06 3.0b131025 Release for hardware version 3.0 only. 2012-12-21 2.4b120323 Fix when configure VLAN setting after reboot cause can’t access into WEBUI. 2011-03-23 2.0 Initial Release for hardware version 2.0. 2011-03-23 1.0 Initial Release for hardware version 2.0.